The Gall of Those Azaleas! I should have been finishing up planting the last quarter of the vegetable garden but instead I was trying to find homes for a bleeding heart and some corydalis that I purchased at last Saturday’s Charlton Garden Club plant sale (www.charltongardenclub.net). Local garden club plant sales are a great way to pick up both common as well as a few unusual plant species while supporting a local community service organization. Being a member of the Charlton Garden Club, I can say with certainty that we use the funds for plantings on the Common and around town, donate fresh flowers and books to the library, and hold community events, like the flower show on Olde Home Day. Members had painstakingly dug plants from their garden to donate to the plant sale and we were rewarded with a seemingly relentless rain that left us all pretty wet and chilly by the end of the day. At any rate, as I was looking for a spot to plant my new acquisitions in the woodland walk garden, I noticed large, swollen growths on the leaves of several deciduous azaleas. Right away it was apparent that they were azalea galls but I had not noticed them on the azaleas on this side of the yard before. The odd, irregularly shaped galls come in pretty shades of pastel green and pink and cream. According to the literature, they turn brown as they mature and will eventually fall to the groudn. They are cause by a fungus, Exobasidium vaccinii. It was also mentioned that this fungal disease can infect blueberries, andromeda and leucothoe so I will check those plants shortly. 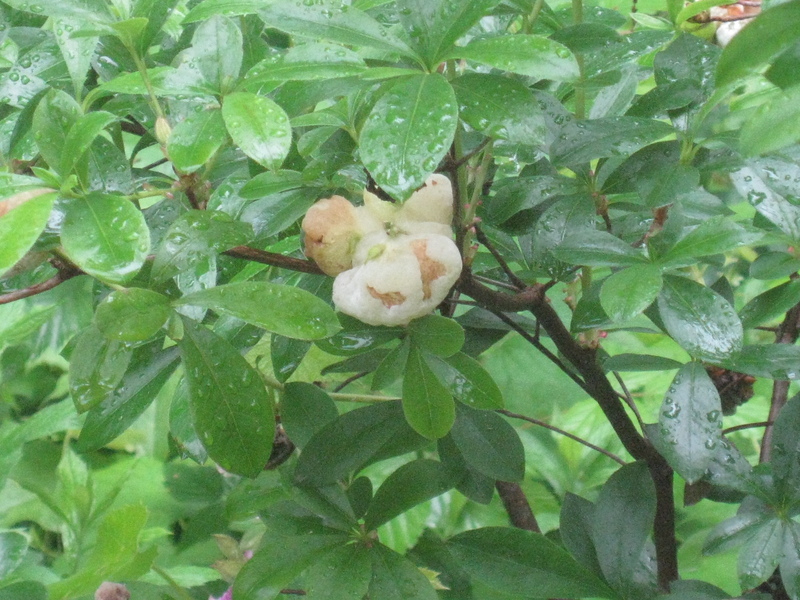 Azalea galls are large and noticeable. Most folks living in the Northeast will remember than last year we had a particularly rainy growing season. 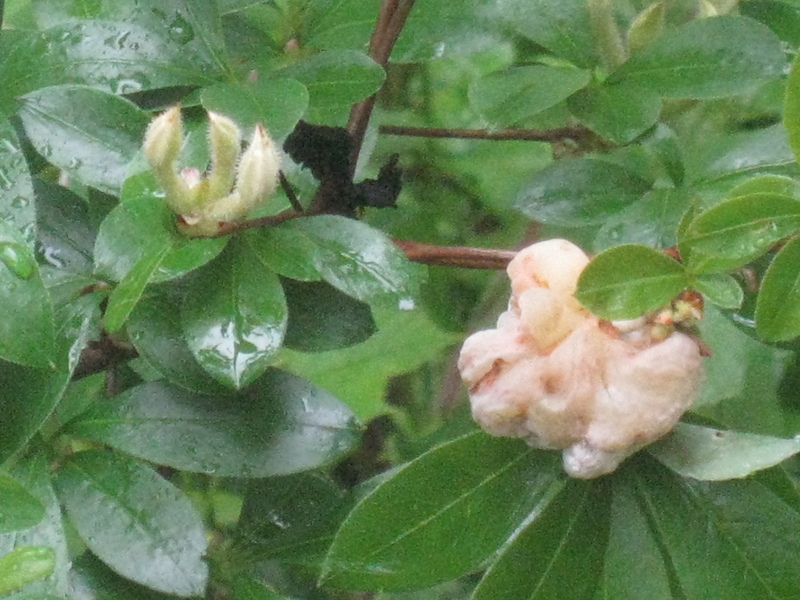 The severity and spread of azalea gall fungus is weather related. Usually the disease does not cause serious problems except during extended periods of wet weather which favors the development of spores, their dispersal and infection rates. Spores are spread by rain and wind. 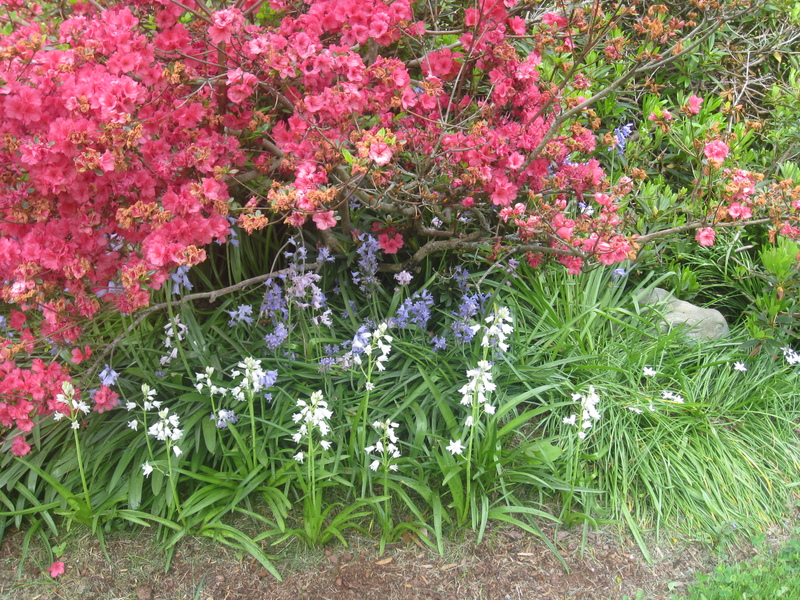 Azalea underplanted with wood hyacinths. Last year I did notice some galls on this shocking pink azalea that came with the property and which is underplanted with pulmonaria and wood hyacinths. I thought I had pruned out all the galls but apparently not. Usually around June any galls remaining will appear covered with a whitish coating which goes on to produce many, many spores which can be picked up by the wind and rain and spread to other plants. The fungus overwinters on the plant and then becomes visible as galls the following spring. The galls may form on leaves, flower buds, and new shoots. Prune out these interesting looking growths before they turn brown and fall to the ground. The least toxic way of controlling this disease is to prune off the galls and dispose of them. At the same time, improving air circulation by removing some overhanging branches and spacing plants far enough apart to allow for air flow is a good idea. However, during long periods of rainy, cool weather, even these changes do not seem to reduce disease incidence that much. Several fungicides are labeled for control as well. Call the UConn Home & Garden Education Center (877 in CT) 486-6271 for chemical control suggestions. Apparently there are some new azalea leaf gall resistant varieties that might be considered if this disease is a recurrent problem. Ask at your local garden center or nursery if they carry any of them. In the meantime, where did I put those pruners? Chemical control is regulated individually by each state. Since this blog is read by people in more than one state, the chemical control may or may not be allowed in the area of the caller. Chemical usage and regulation is constantly being updated. By calling us, we give the most up-to-date legal information when recommending control measures.